Both locals and tourists who decide to resist the heath in Madrid during August instead of running to an overcrowded beach know they’re in for two treats: the first one is enjoying a relatively empty city, which is always a delight; and the second one are the street parties that take place in mid-August honouring San Cayetano, San Lorenzo and the virgin of La Paloma. 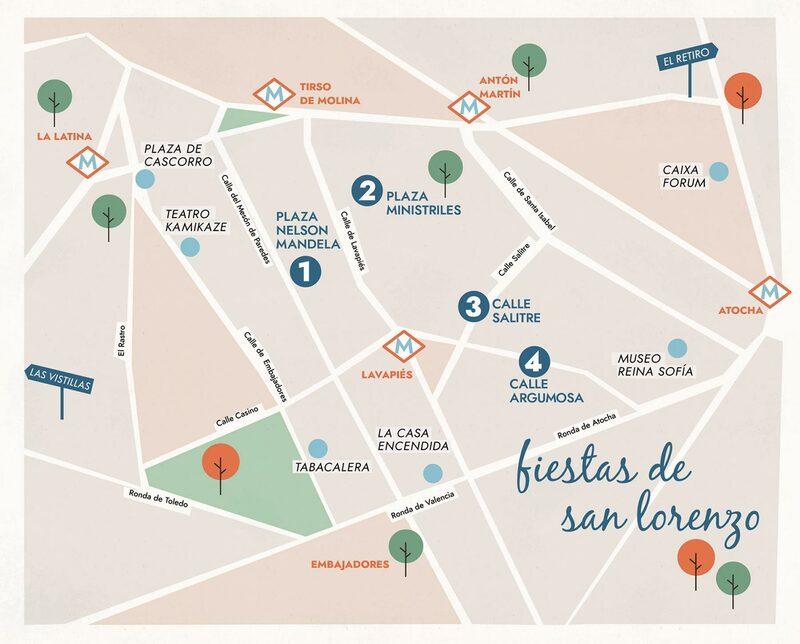 San Lorenzo starts today, August 8th and it will be happening in Lavapiés, the most diverse neighbourhood of Madrid. 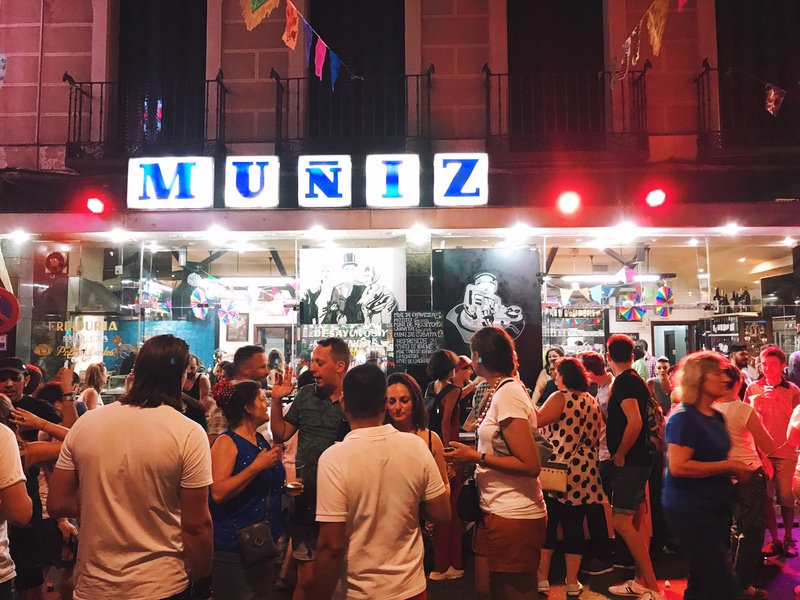 During the day you will be able to enjoy several activities organised by the locals around the streets Argumosa and Salitre, from local theater to many workshops, food, and activities for all the family. At night you’ll have three different stages to enjoy live music: Nelson Mandela Square, Lavapiés Square & a stage in Argumosa Street. 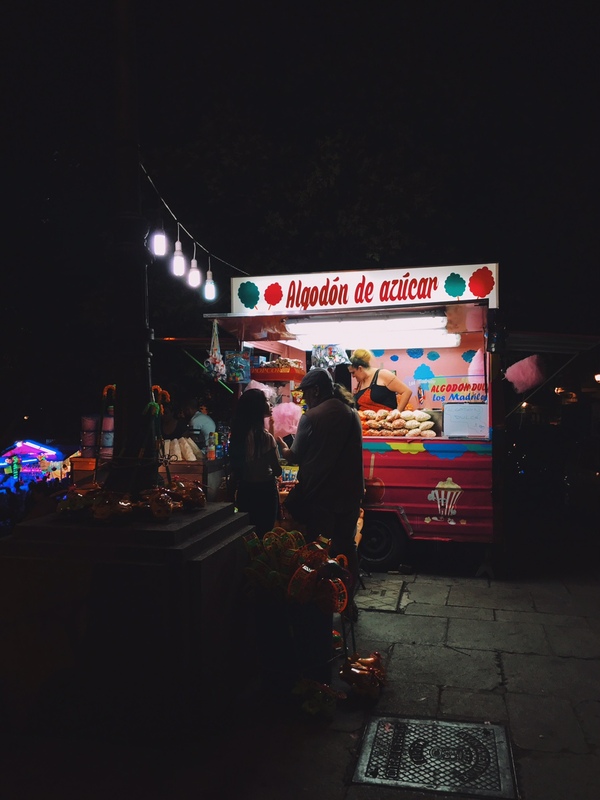 The San Lorenzo celebrations are especially nice and important because the diverse nature of the neighbourhood logically marks the distinctive sounds of their street party. You will enjoy a great mixture of sounds, flavours and cultures. On Wednesday you can enjoy the music of Pilu Velver, Estraperlo y Mr Fox DJ, all local bands, in Nelson Mandela, from 21:45. On Thursday 9th, also in Nelson Mandela, Jah Song will hit the stage at 20:45, followed by Jazzo Blexx y Lirikal Afro at 21:45 and a DJ set of the Sonidero Mandril collective at 23:30, I’ve listened to these guys before and I love them, if you like to dance to a very diverse mix of tropical music and electronic beats, don’t miss it! In the mean time, for all the electro-lovers in the stage on Argumosa Street, The Grooves will be playing at 22:15 followed by the girls of Bleset at 00:00. Lin Cortés will play at Nelson Mandela Square Friday night, I haven’t heard him yet, but they say his a master of different styles. Cortés will be followed by the group Manglar, from Cádiz, known by their Tropical African rhythms. Finally on Saturday the Argumosa Street stage will be ready to receive the versatile Argentinean singer Miss Bolivia who will play a mix of cumbia, hip-hop, dance and reggae. 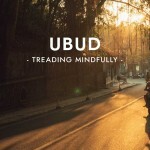 Be ready! 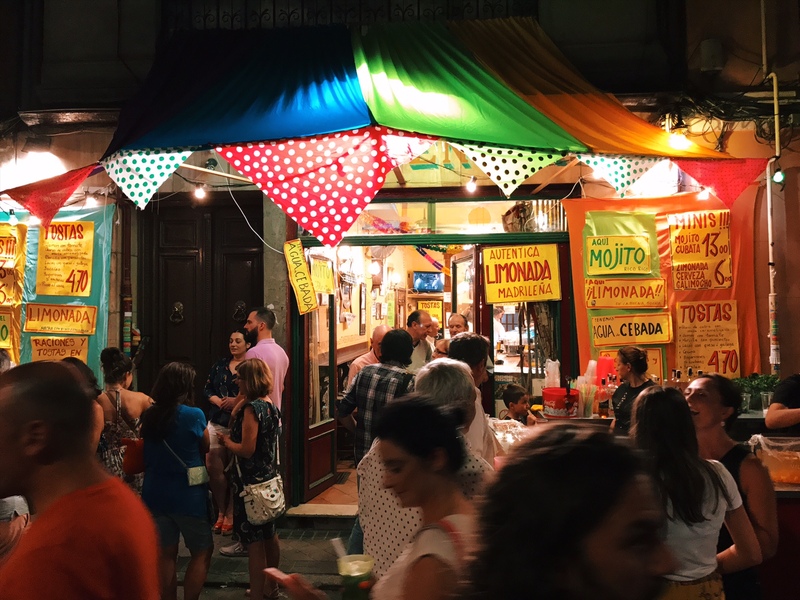 Brazilian music lovers will also be able to enjoy it from Wednesday to Friday around Salitre Street with the live music and the dance workshops organised by the Asociación Cultural Brasileña Maloka. And it you’re in for the religious acts for San Lorenzo, they will take place August 10th in San Lorenzo’s Church. 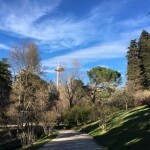 You can check the whole program in Madrid’s Web. There will bars outside and music all along. 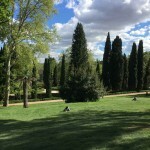 La Paloma, mola. La Paloma Street Party is a bit bigger and more international than San Lorenzo. A very deserved reward to all who endure summer in the city. 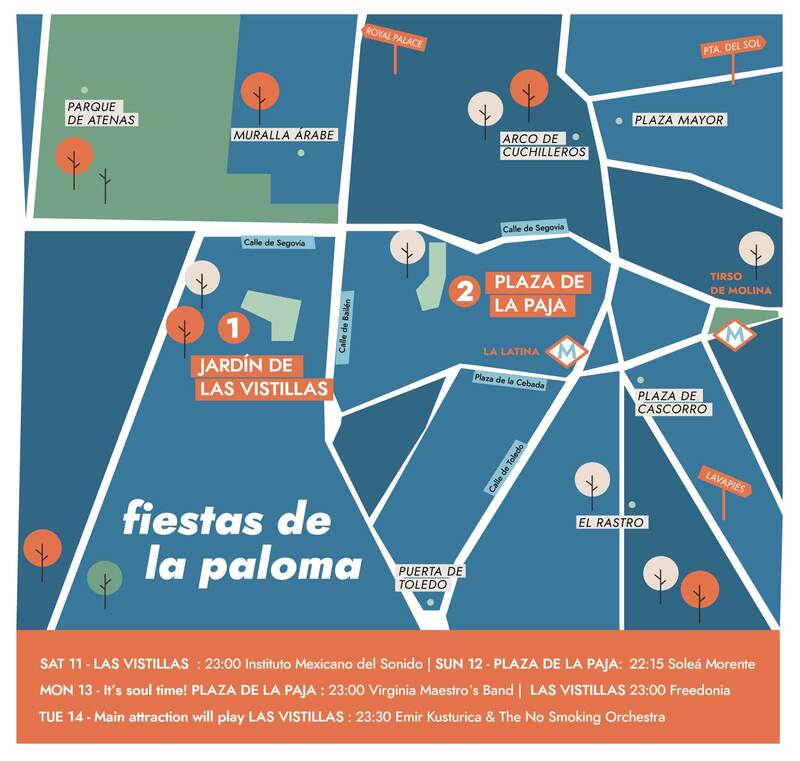 The celebrations take place around La Latina, all the bars and the streets will be playing music so you’ll have a nice soundtrack as you wander the streets, and the two main stages will be localted in la plaza de las Vistillas, one really fresh and delicious garden perfect to enjoy the sunset, and la plaza de La Paja, basically the core of La Latina neighbourhood. 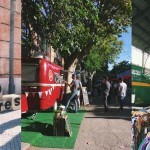 As well as with San Lorenzo, during the day you can enjoy a bunch of typical acts, workshops and try some street food. Musically the heat goes up at night, starting on Saturday with the Instituto Mexicano de Sonido (IMS) in las Vistillas at 23:00., followed by DJs Lou Garx, Tita Galletita & Makutech @ Sala Rock Palace at 01:00. En La Paja Square, on Sunday 12th at 22:15 you can see the singer Soleá Morente, with a band from her home town, Granada, Napoleón Solo, they promise to delight everyone with a mix of flamenco, pop-rock, vocals, and psychedelia. Meanwhile in Las Vistillas at 23:00 Los Punsetes will be rocking the stage. On Monday there will be a lot of soul. At 23:00 in La Paja Virginia Maestro‘s band will be playing some gospel, doo-wop and rhythm and blues. And in Las Vistillas there will be Freedonia, one of the most important soul bands in Madrid. 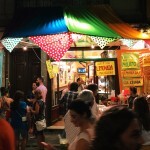 Street food around the streets of La Latina during La Paloma. Finally the main act of this year’s parties will take place on Tuesday (Wednesday is a National holiday!) at 23:30 when screenwriter, filmmaker and musician Emir Kusturika take the stage with his wonderful sidekick band The No Smoking Orchestra. This will be in Las Vistillas. If you’re awake on August the 15th that’s when the religious festivities take place on the Nuestra Señora de La Paloma’s church. That very same day, at night in the La Paja Square the parties end with the prizes for all the contest celebrated suring San Cayetano, San Lorenzo y La Paloma 2018. 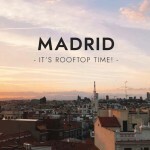 You can check the full program in Madrid’s Web.